Looking for some plans outside the house this fall? 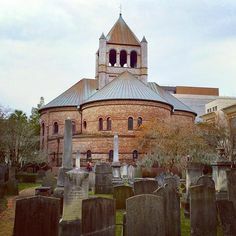 A simple scroll through the charlestoncvb.com calendar will render a long list of possibilities. Here are just a few of the events we’re looking forward to this season. The first annual Charleston Arts Festival is brought to you by the creator of Jailbreak. Though Jailbreak’s technically defunct, the CFA finale will take place at the Old Jail on Magazine Street, so it’ll be like a Jailbreak reincarnated. 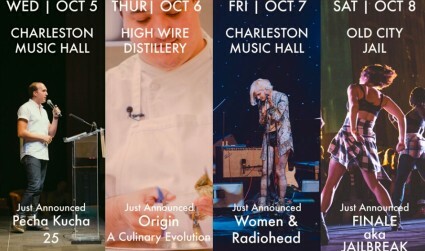 Also on the agenda for CFA is Pecha Kucha 25 (8 presentations by local members of Charleston’s music community and Women & Radiohead, where local female musicians will perform Radiohead songs. 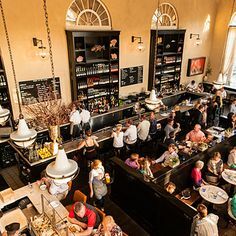 Both of the latter events take place at the Music Hall, while the other facet of CAF, a Culinary Evolution, will go down at High Wire Distillery. For tickets, dates, and further details, go to charlestonartsfestival.com. 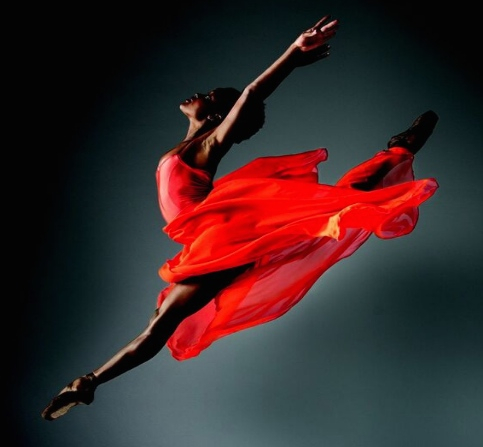 This will be Charleston’s 33rd year with the MOJA Arts fest, a celebration of African-American and Caribbean Arts. The city will be taken over by isual arts, classical music, dance, gospel, jazz, poetry, R&B music, storytelling, theatre, children’s activities, traditional crafts, ethnic food, and much more. Guess what else — most events are free! Ticketed events are priced modestly. For further details, see mojafestival.com. The Footlight Players will bring their own festival to life on Nov. 3 at Pierce Park Pavilion (1801 Pierce Street, Daniel Island). Celebrating all that is fall, the fest involves a heapin’ helping of Lowcountry boil, plus bee, wine, and a silent auction. The Shem Creek Boogie Band will provide the beach music soundtrack, while SC Shagging Hall of Fame dancer Claude Robertson and dance partner Linda Ouzts cut a rug. Tickets are $35 and will benefit the Footlight Players, one of the oldest community theaters in Charleston. Something for the teens or any young adult fiction lover, Y’allFest celebrates YA fiction, welcoming best-selling authors to the city for a series of events at Charleston Music Hall, the Charleston County Library. This year’s featured authors are many, and they include Beautiful Creatures’ Kami Garcia, Sara Shepard (Pretty Little Liars), and Renee Ahdieh (The Wrath and the Dawn). Check yallfest.org for a complete list and schedule of events, like book signings and forums. 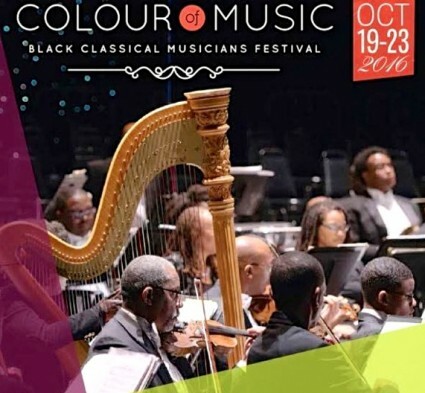 Colour of Music celebrates black classical musicians. 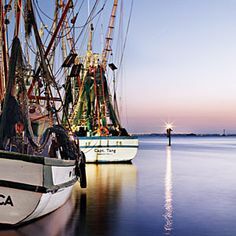 This year’s edition brings renowned artists from around the world to Charleston for the occasion. Some notable events include the debut of18th-Century African-American French composer Chevalier de Saint George’s only discovered opera as well as “The Anonymous Lover,” featuring Magali Leger, native of Saint George’s birthplace, the Isle of Guadeloupe, showcasing the festival’s All Things French theme. The Masterworks series opens with the petit opera on Thurs. Oct. 20 at the Gaillard Center downtown and will also include Bruch’s Violin Concerto No. 2, Op. 44 in G Minor. What are you looking forward to this season? Beep Beep – We’ve got us a TRAFFIC JAM! 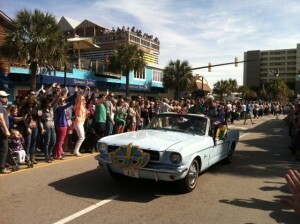 Folly Beach celebrated Mardi Gras Folly style on Saturday with their 7th Annual Folly Gras Festival and Parade. This family friendly event takes place every February and encourages attendees to show up in their best Mardi Gras outfit. The parade takes place on Center Street and features food vendors, street vendors, and various bands. This Saturday Folly Gras got off to a slow start, with none other than a parade TRAFFIC JAM to begin what resulted in a looong day of eating, drinking, dancing and avid bead collecting. 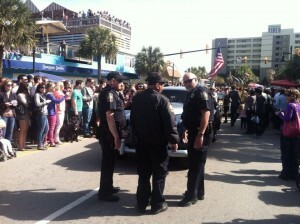 Locals & out-of-towners gathered together at Center Street on Folly Beach ready to strut their stuff at the start of the 2pm parade, only to be held up by an immobile classic car which was promptly “kicked to the curb” to sit the rest of the parade out. Moving along just fine, Mayor Tim Goodwin led the way in a baby blue Mustang, followed by local businesses and socialites decked to the nines showing their NOLA spirit. The ever-so-colorful dunes properties convertible followed closely behind, sporting dunes flags, agents in costume and a never-ending supply of beads, keychains, candy and more for all the kiddies to enjoy. Festival goers this year enjoyed musical jams by the Shakin’ Martinis, the Hungry Monks, Soulfish, Hollow Point and Gaslight Street, with NOLA inspired foods and costumes to round out the four hour event which carried on late into the night after streets were reopened. 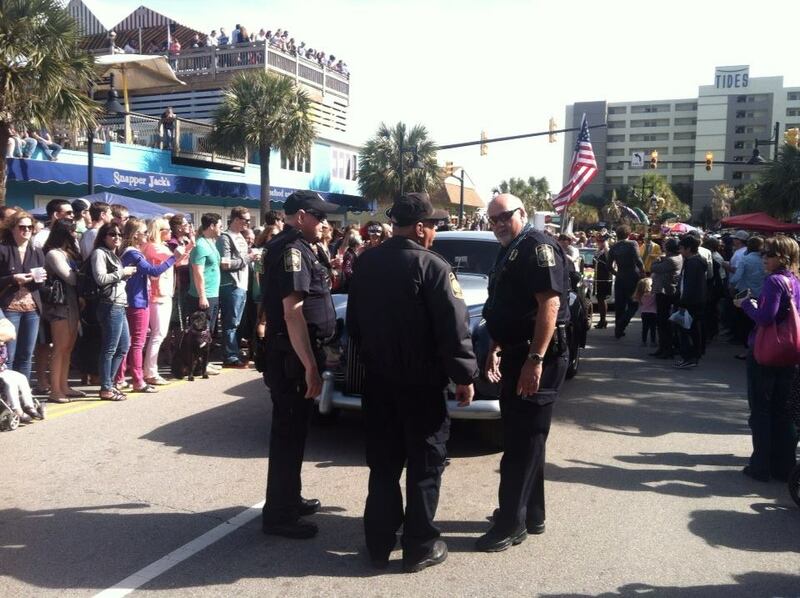 We had a front row seat from the dunes properties Folly Beach office, which is located right in the middle of where the parade took place at 31 Center Street. 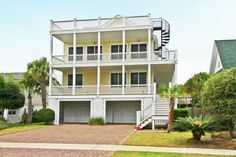 Still at its original location since 1998 when it opened, the Folly office houses our vacation rental program, along with property managers and real estate agents that are always available. Come by and see us! 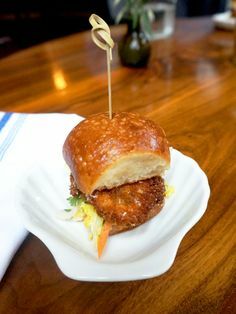 Come down to Folly Beach and enjoy food, drinks, and other offerings of local Folly Beach restaurants and clubs for the Taste of Folly. Center Street will be closed off for the festivities which will include tents for each establishment for tastings, live music, and kids activities. There will also be a chili cook-off, a hot dog eating contest, a silent auction, a date auction, and the server olympics. Eric Penrod & Tim Davis Duo & Folly Beach Reggae All-Stars will be performing on the Center Street stage. Guaranteed to be a fun time for all. New this year will be the Battle of the Bartenders, sponsored by Virgil Kane, held at the Blu, where each bartender will make their own take on a cocktail with Virgil Kane, and the crowd will be the judges. Hot Dog Eating Contest 12-1, Date Auction 2-3, Awards Ceremony 4:30-5. Live music in between. Click below for a map, schedule, and chili cook-off rules. Here is your March 2010 real estate market report for Folly Beach. There were 6 properties sold during March 2010. They included one lot on Little Oak Island, a Mariner’s Cay for $412k and an oceanfront property for $655k. The average sales price for the month was $393,400. This continues the downward trend on prices and it seems like many sales are pushing prices lower. This has resulted in a higher number of transactions, as buyers realize that prices are now within reach and pull the trigger on the island lifestyle they have been dreaming of. Come on down to the island! The prices are fine! If you have always thought that living at the beach was too expensive, then think again. In 2009 Q1, the average sales price was $438,000 and that has dropped to $401,000 in 2010 Q1. 22 properties sold in 1st Quarter 2010, compared to 11 in the 1st Quarter of 2009. The lower average sales price explains the reason for the increased number of sales. 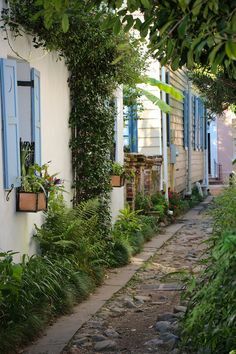 More people are able to move onto Folly Beach, leaving behind the feeling that it is too expensive to live on the beach. Increased demand typically signals the bottom of the market, so if this trend continues we could see prices rise in the future. 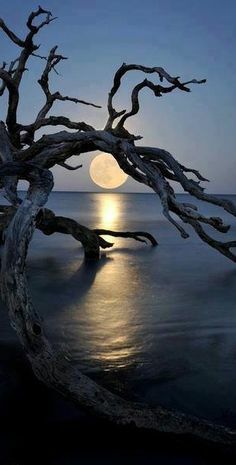 Now is a great time to buy a Folly Beach home because of the combination of low prices and low interest rates. Make sure you are working with someone who is an expert in the market and knows their way around the island. Please contact me here with any questions. I have seen a Folly Beach lot that is available for the cheapest price I have seen in a long time. How much is cheap? Not $500,000. Not $300,000. Not even $200,000. Think lower. Click here to find out. If you are a builder, or investor, or interested in living on Folly Beach this is a great opportunity. 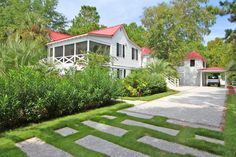 I can help guide you through all the due diligence regarding the property, and can walk you through the permitting and building process on Folly Beach. This is one of the lowest prices for land on Folly Island that I have seen in a long time. Call me for details or click here to contact me. This Saturday March 13th, 2010, the streets of Folly Beach will turn green to celebrate Saint Patrick’s day, and Folly party-goers will race around Center Street competing for prizes in the annual pub crawl. Everyone please use caution, from what I understand, the open-container law will be lifted, but the streets will be open to traffic! Please be careful “crawling” from one pub to the next. A good time will be had by all, including me, so call me if you want to meet up! I’m buying! This is an election year on Folly Beach and election day is April 6th. There are three candidates for the Mayor’s office, and seven candidates for City Council. Folly Beach Now is covering the election by providing information that will help voters make informed decisions. You will find answers to your questions about where the candidates stand, information about their backgrounds, and important meetings and dates. Check out the Folly Beach Now election page here. Get all your Folly Beach election coverage here. Please contact me with any questions or comments. You would be amazed what you can buy on the beach!!! 8 Properties sold in the month of January 2010 on Folly Beach, beginning this year with a healthy sales volume just like late 2009. The sales ranged from $225,000 to $550,000 with an average sale of $375,425. The low prices are the reason for the increasing number of sales. Buyers are beginning to bite on the great deals that can be had on Folly Beach. 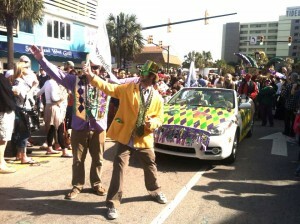 There will be Mardi Gras celebrations on Folly Beach this Saturday February 13th, 2010 from 12-5 for the annual Folly Gras party and parade. Wear your beads and most colorful outfit and come down to Center Street and celebrate New Orleans style. Decorated Floats, Golf Carts, Marching, & Alternative transportation only! NO CARS OR TRUCKS UNLESS THEY ARE PULLING A FLOAT! You must be in Mardi Gras costume to participate! We Welcome decorated pets! We have asked our restaurants to prepare special New Orleans food fare and Mardi Gras drinks beginning at 1 pm. There will also be a trophy awarded to a restaurant for Best Food Fare. We will have live music set up at different locations on Center Street. The Parade will begin at 2 pm and start at the Public Boat Landing. When the Parade ends at the Holiday Inn, Indian, Huron, Hudson will reopen. There will be music, dancing and food in the streets provided by our own businesses from 1 to 5 pm. Masks will be sold at City Hall for $2.00 first come first served. Free beads given with each mask. The Folly Beach Arts and Crafts Guild will also be in the Park with their crafts and vendors. If you have any questions, please contact Mary Cunningham at City Hall; 513-1836 or 708-1113. Act fast on this opportunity to own an incredible Folly Beach deep water property for a steal! The builder has thrown his hands up and will let it go at auction prices to avoid foreclosure or short sale. This waterfront property will need to be finished which gives you a chance to add your tastes, and has awesome views of the Folly River Wait! It gets better, it is sold with a shared deep water dock! This is a huge home on Folly Beach for a fraction of what it should really cost. There were two available now only one left. For information and pictures click here.